The MM2000-PP antenna mast is suitable for use in either open areas or in electromagnetic absorption chambers. Guy wires and anchoring pins are available for antenna installation in open areas. The MM2000 antenna mast has no metal parts above the drive unit. Special designs are available upon request. The mast tube can be delivered in 2 seperate parts for easy transportation and storage. The MA2000-PP antenna mast is suitable for use in either open areas or in electromagnetic absorption chambers. Guy wires and anchoring pins are available for antenna installation in open areas. Metal parts are located only in the base plate and the drive mechanism (max. 0,3 m above ground level). The MA4000-DG antenna mast is suitable for use in either open areas or in electromagnetic absorption chambers. Guy wires and anchoring pins are available for antenna installation in open areas. Metal parts are located only in the base plate and the drive mechanism (max. 0,3 m above ground level). The antenna mast is designed for antennas up to max. 12 kg. For the convenience of the user, the mast comes on wheels, and furthermore it can be folded down for easy handling and transportation. The control of the antenna is performed by duplex optical fibers, and the automatic operation is performed via GPIB IEEE 488.2. 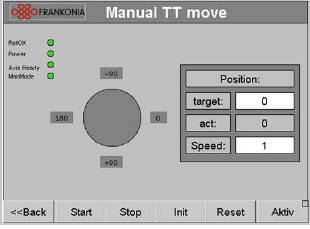 For the control of the antenna mast, the Frankonia controller FC06 is perfectly adapted. The MA4000-XP-ET antenna mast is compliant with CISPR 16-1-4 BORESIGHT and ANSI C63.4 requirements and suitable for use in either open areas or in electromagnetic absorption chambers. Metal parts are located only in the base plate and the drive mechanism (max. 0,4 m above ground level). The TW4000-EP antenna mast is suitable for use in either open areas or in electromagnetic absoption chambers. Metal parts are located only in the base plate and the drive mechanism (max. 0,4 m above ground level). The TW4000-PP antenna mast is suitable for use in either open areas or in electromagnetic absoption chambers. Metal parts are located only in the base plate and the drive mechanism (max. 0,4 m above ground level). The TW4000-PP-ET antenna mast is suitable for use in either open areas or in electromagnetic absoption chambers. Metal parts are located only in the base plate and the drive mechanism (max. 0,4 m above ground level). Adapters for all commercially available antennas are available. Special designs are available on request. All antennas during polarisation rotate around their axis so as to eliminate any elevation errors. Limit switches and the general mechanical design ensures a reliable system operation. FRANKONIA’s innovative range of positioning devices is entirely compatible with EMC chamber environments. In case a tilting antenna function in step-wise mode is required, the FRANKONIA boresight mast (FBM) is the right choice. FRANKONIA’s FBM offers an electrical tilt function from 0° to 50°, as well as an electrical vertical movement from 1 to 4 meters. 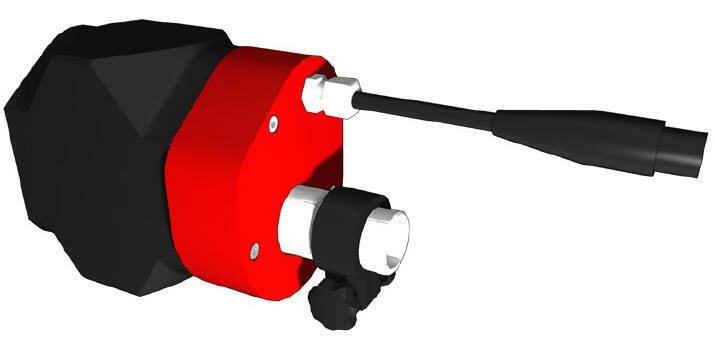 The integrated pneumatic unit ensures the H/V polarization. 16-1-4 and ANSI C63.4. The FBM has been designed for both tilting and no tilting functionality. Various antennas can be attached with suitable adapters (not included) to the antenna mast. The FBM carries up to 8 kg antennas incl. adapter using the tilt function, and up to 12 kg antennas incl. adapter using the normal operation without tilt. A functional safety is guaranteed in case the antenna incl. adapter does not exceed the maximum weight and is balanced with counterweights (2x 3 kg weights included) during setup. The polarization unit FPD-01 is designed for the polarization of antennas, and is a perfect complement to the antenna stand FSM 1.6 or FSM 2.0. 3/8” thread is provided for the installation of a stand. The control is effected by the controller FC06 which is equipped with an additional 24V output. The control signal is fed through the shielded wall via an EMC filter that is mounted on the carrying unit. from 0.9 / 1.2 m to 1.6 / 2.0 m (depending on the model). The height setting is made within a few seconds. of the three spider legs can be adjusted individually for a coarse level adjustment on uneven or inclined mounting surfaces.